We are adding hot tubs to holiday homes, log cabins, lodges, cottages, caravans, chalets….every holiday accommodation option you can think of! Aside from the obvious benefits for the owners of aforementioned cottage…the revenue possibilities are brilliant. Figures show that adding a hot tub to your holiday cottage can take occupancy rates from 60% up to 80%...and it also adds an average of £70 per week onto the rental price. Happy days we hear you say! If you have been considering upgrading your holiday cottage to include a hot tub then we highly recommend choosing one of the Jacuzzi Hot Tub range. Here at Hydrolife we are on hand to advise you on the perfect fit for your needs and remove all of the stress from the installation process! We have 9 Jacuzzi Hot Tub models available to suit holiday cottages – 3 different sized Lodge models and 6 from our J200 Series range which can be easily adapted to conform to HSG282 regulations. These models will seat anywhere from 2/3 and up to 6 people which makes them the perfect addition to a holiday cottage or rental. 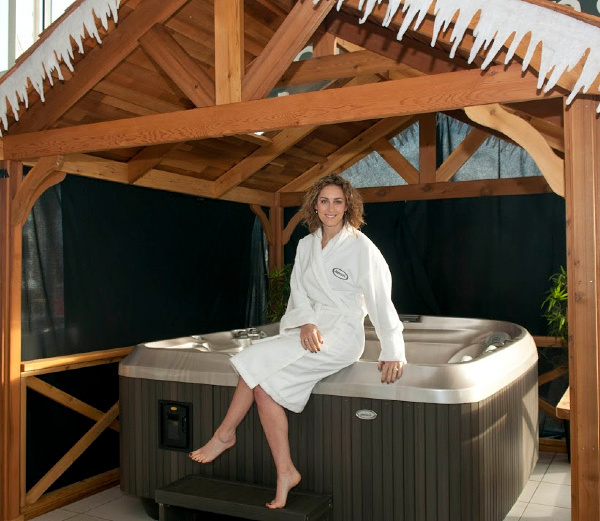 Whether you are looking to serve families, cater for special celebrations and events or appeal to more romantic getaways…we have the perfect hot tub for your holiday cottage needs!